LUMPENPROLETARIAT Some, such as Dr. Michel Chossudovsky, have argued that corruption, having reached saturation point, had now entered the age of inquisition, where the state openly kills in broad daylight, not by accident, but by design and with the intent to intimidate the general public and send a message of horror, to show the people what the state is now capable of doing. JUSTICE FOR ALEX NIETO—[accessed 8 MAR 2016] Who was Alex Nieto? Alex dreamt of helping guide youth in a positive direction, which is why he aspired to become a probation officer. He had a gigantic heart, and everyone loved him for his intellect, gentleness, and kindness. Alex was enjoying his dinner near a bench with a sunset view to Twin Peaks, dressed for his security guard shift with his licensed taser at his hip. He was also wearing his elegant new 49ers jacket, and minding his own business. A dogwalker called 911 simply because he didn’t like the sight of this young Latino working class man on Bernal Heights. Police confronted Alex as he was walking downhill on his way out of the park, and killed him with two sequential volley of shots. The first volley took him down to the ground. The second volley of over ten shots killed him. In the 911 Call (narrated by Chief Suhr at the Town Hall Meeting) and in dispatch audio, Alex is simply described as eating sunflower seeds or chips with his taser “at his hip”, never drawn. He is never described as threatening anyone. All the same, a battalion of officers was sent to the hill to confront him. A Bernal Heights native, Alex routinely ate dinner in Bernal Park, before going to his security guard shift. He had been with his parents before going out. Officers racially profiled Alex as a gangbanger exclusively based on his description as a Latino male wearing a red jacket. Racial profiling is illegal and a violation of civil rights. Officers gave Alex no chance to respond to warning before they shot him to the ground with two or three shots. With Alex injured on the ground, officers decide—without any evidence of danger—to continue shooting at him, until he stopped moving. 59 bullets were fired. This looks to us like an unjustifiable police murder —a deliberate execution— of an innocent man. We also believe SFPD and the City and County of San Francisco are involved in a cover-up of an unlawful killing. We believe they fabricated a false narrative of events and have hid or tampered with evidence. Alex is reported behaving erratically by eyewitnesses. Witnesses recount seeing Alex at the park peacefully sitting alone on the bench enjoying his burrito. 7:11pm: 911 dispatch receives a call reporting a Latin male adult with a red jacket, black pants, and a handgun on his hip, pacing near a bench close to a chain linked fence on Bernal Hill. 7:14pm: Caller (who stays on the line while police arrive) reports Alex eating chips or sunflower seeds. 7:18pm: Calling party hears shots fired by police. A couple -Timothy Isgitt and Justin Fritz- called 911 and erroneously reported Alex as having a black gun on his hip. Alex was carrying his licensed *holstered* taser. The caller does not report that Alex is bothering anyone or posing any type of threat. The caller simply reports Alex is walking near the bench, and eating. Alex was wearing a holstered taser that looks like a gun. When drawn, this type of taser emits a red dot. Alex was dressed for work, wearing a *holstered*, licensed taser, as part of his security guard uniform. A Sergeant and Officer from Ingleside are the first to arrive on scene. Alex is engaged 75 feet away up a hill, with his back to the west, Officers looking towards horizon. An SFPD Patrol car entered the park and drove up a fire trail before stopping approximately 75 to 100 feet away. Alex at that time was casually walking down the trail to the Park’s entrance, with his hands in his pockets. Two Officers emerged from the patrol car and immediately took cover using their car for protection. Alex drew his taser, and tracked officers with the red taser dot. Alex wounded, goes down in a prone and tactical position. Within seconds a quick volley of bullets were fired at Alex. No additional orders or any other verbal communication was heard between the first Officer yelling “stop” and the initial volley of gunfire that rang out. Alex did not threaten anyone nor verbally resisted Officers. Alex did not attempt to grab or point any object at the Officers prior to being shot. Alex falls to the ground after the initial shots. Prone, wounded, and on the ground, Alex continues to “track” Officers with the red laser dot. Eye witness’ revelations do not see Alex point any object at the Officers, before or after Officers shoot him to the ground. Eye witness believes Alex to be mortally wounded after the initial shots, and says Alex falls over his hands. Officers say they feared for their lives and shot him repeatedly, until he stopped moving. After a brief pause of just a second or two, another barrage of shots were fired. The Officers’ bullets struck Alex in his forehead and at least nine other places leaving his body grossly disfigured and mortally wounded. Nearly six months after Alex was killed, the Medical Examiner released an autopsy report that deems his death a homicide. The autopsy confirms fourteen to fifteen bullet wounds (one entrance wound is for two shots, therefore, at least 15 shots hit Alex.) Eleven out of the fifteen shots caused downward trajectory wounds. That is, eleven shots are fired from above Alex into his face, temple, chest, shoulders, and back. Seven of those shots are in a head to toe downward trajectory indicating that Alex was in a completely defenseless position when officers fatally wounded him. This could imply criminal intent and murder. Please check our Diagram and Analysis of the Autopsy Report, for more information. The pause between the first and second series of shots is relevant because officers made a deliberate decision to barrage Alex with the shots that actually killed him. This could imply criminal intent and murder. Learn more at JUSTICE FOR ALEX NIETO. “We turn our attention back to the police murder of Alex Nieto. There is a federal trial taking place, right now, in San Francisco. This is an incredibly important case, in which the police shot down—one more time—shot down somebody, who—I guess—they just felt like killing a person of colour. “Joining us to talk about this situation is a spokesperson for the Justice4AlexNieto; his name is Ben Bac Sierra. And he joins us from San Francisco. It was a busy day in court. And, I wanna hear all about that. BENJAMIN BAC SIERRA: “I will. Thank you for inviting me to talk, Dennis. 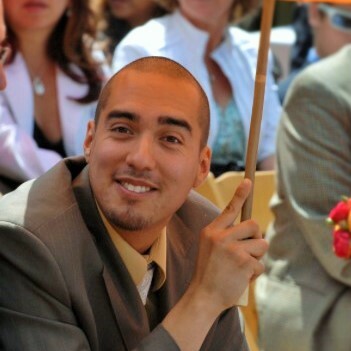 Alex Nieto was a security guard, a City College of San Francisco student, a beloved son, community activist. “He was a security guard who was going to work on Friday, March 21st of the year 2014. He had bought a burrito and some chips. And he was eating it at a very peaceful, beautiful place to enjoy the view called Bernal Heights, which was only one block away from his house. “And, so, he had gone up there to relax, to meditate, to eat before what was, probably, going to be a pretty busy night at the nightclub where he worked as a security guard. He was already dressed for work. He was wearing black pants, his work boots. And he also had his licensed Taser holstered at his hip. “Now, the people who called the police on him do not even claim that Alex Nieto ever even looked at them. But they called the police anyway because they thought Alex had a gun on his hip. “And the police come in a military, tactical fashion, very aggressive. And why did they come in such an aggressive fashion? 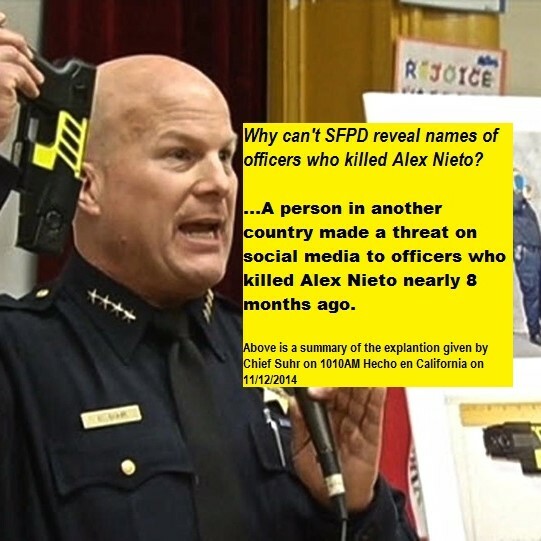 Well, even though Alex Nieto has done nothing wrong, they get over the radio a description that he is a Latino male, six-foot tall, wearing a red jacket. And, with that description, they immediately profile Alex Nieto as a gang member, even though Alex Nieto has never been arrested in his life. He has actually volunteered at the Juvenile Correctional Facility to help out youth. I knew him very well. He was a practicing Buddhist. “He had no idea anybody had called the police on him. He walks down the hill. The police are approaching him in a very aggressive fashion. In fact, we now know, based on the testimony in court, that they think they are cowboy cops. They do not wait for any type of back up. They actually bypass other police officers, that are near them. And they go to kill whoever is on the hill that fateful, unfortunate night. 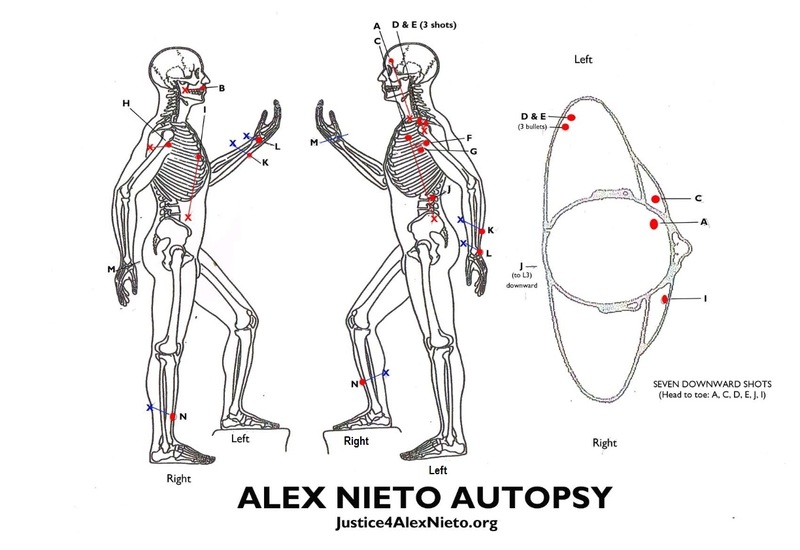 “They see Alex Nieto, a neutral witness claims, that Alex Nieto was casually walking. The officer, the lead person in charge that evening, Sergeant [Jason] Sawyer, he actually claims when he sees Alex Nieto, Alex Nieto was eating from a bag of chips, walking down a hill. “And the testimony today is even more specific about what happened. But that is the general story of what happened to Alex Nieto. It is: He was shot at 58, 59 times, struck at least 14 to 16 times. And numerous of those shots were while Alex Nieto was face down on the ground. “And, so, this is a fight, that we’re fighting, that we’ve been fighting for approximately two years now. March 21st is coming up soon. March 21st, and that will be the two-year anniversary of his killing. “We made it to federal court. And, so, this is a very rare event because we usually do not get this. They dismiss the case. Or they will settle out of court. And, in this case, we actually get to hear the evidence, present it. “Yesterday, we had a rally with hundreds, if not a thousand, people in front of the federal court building in San Francisco. And we did poetry. We did singing. We had Aztec danzantes, Buddhist chanting. And, so, this is a very beautiful, revolutionary moment. We look forward to all of the evidence coming out. DENNIS BERNSTEIN: “Yeah, well, let me come in here. And, before we get the latest breaking news, I think it’s very important for people listening outside of San Francisco—and we broadcast across the country—that they understand the context here. That there is an attack on the Mission District, this beautiful, historic Mission District, that is really a part of Central and Latin America, has played a very important role in the City. People love the Mission District. BENJAMIN BAC SIERRA: “Dennis. Dennis, Alex Nieto was killed specifically because of gentrification. “I did not fully explain the context of why somebody called the police. Alright? We have two new gentrifiers, new as a far as new to the neighborhood, who come into Bernal Heights. And Bernal Heights was a working class, blue-collar neighborhood, full of African-Americans, Latinos, working class whites, Filipinos, Samoans, multicultural, diverse. “Alex Nieto had lived there his entire life. However, he was able to live there because of rent control. Now, unfortunately, what happened is, starting in the ’90s, that area began to become gentrified. And, not, it’s thought to be one of the most expensive places to live in the United States of America. Places where you could buy a house, back in the ’70s, for $35,000 are now—the same, exact piece of property, the wood hasn’t changed, right, it’s not made of gold now—those same houses are now worth $1.7 million dollars. “And, so, these new people came into the neighborhood. And they see Alex Nieto. And they think of him as being out of place. And they end up calling the police because they have never had to have a security guard job. They don’t understand. What? A Latino with a red jacket and he has a gun on his hip? He’s not even facing them. He’s actually peacefully eating a burrito. But, supposedly, these people see him with his hand resting on his hip. “And they, actually, they do not both see it. Only one of them sees this. And he tells his friend: Hey, did you see the guy with the gun? His partner tells him: No, I don’t see the guy. I didn’t see a guy with a gun. And the guy who supposedly saw the weapon first, he doesn’t even have the guts to call the police, himself. He tells his friend: Well, I saw a guy with a gun. You call the police. BENJAMIN BAC SIERRA: “Oh, what a horrible story. A very horrible story, here, is that we what have is the police understanding immediately after they killed Alex Nieto, unjustifiably killed Alex Nieto. Because right after they killed him, they knew that this man did not have a hand gun. And they claimed that Alex Nieto—it seems like they were just concocting the story. And we’re proving this right now. “But I will go over what the police narrative is. The police narrative is that this person, Alex Nieto, who has never been arrested in his life, who has less than two hours before he has to go to work, is walking down the hill. And, notice here, the police officer, himself, Officer Sawyer, said: He’s eating from a bag of chip. This person, he’s eating from a bag of chips. “Now, think about that. When we think about a stereotypical person relaxing, we think about: Well, that person is a stiff. You’re on your couch, eating a bag of chips. This person is walking down the hill, eating from a bag of chips. There’s absolutely no reason to regard this person as a menace. And this person, eating from a bag of chips, would have the mind set to, then, know that two officers, who jump out of their vehicle and point their weapons at him is going to, then, throw his bag of chips on the floor, go into his holster, point a weapon at them, and, you know, with a Taser, that doesn’t even fire more than 15 feet—and they’re supposedly 100 feet away—and he’s gonna do this. Right? BENJAMIN BAC SIERRA: “Why are you here? BENJAMIN BAC SIERRA: “What we understood is all of the officers, for one, are professional testifiers, even the rookie, who was on the stand, at the beginning of today. He has claimed that he has testified already over 50 times. His father is a San Francisco Police Department officer. And this person is well-groomed on how to stay consistently accurate with concocted types of stories. “These are all pieces of evidence, that will show the inconsistency and the illogic; and also I have to say the physical evidence will also prove that the police are–just. It’s impossible for us to believe their narrative. “I invite you all, listening today, to follow on Justice4AlexNieto.org. DENNIS BERNSTEIN: “Alright. Were gonna leave it right there. But Ben Bac Sierra, we’re gonna stay in touch with you. We appreciate the great work you’re doing. 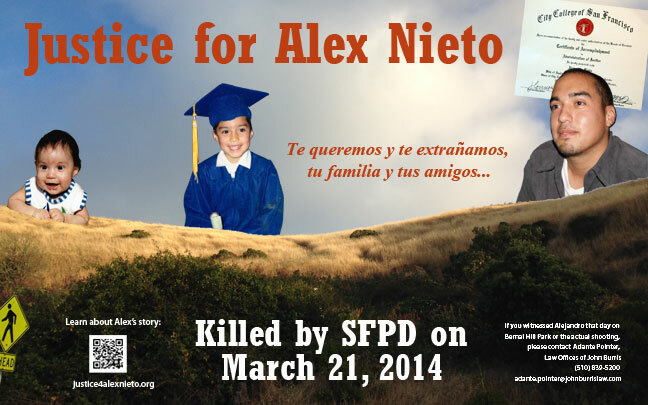 And we will remember and celebrate the life and times of Alex Nieto, how he died. And we will cover that moment when that justice comes. The rally was held on day one of the trial in front of the United States federal courthouse in San Francisco’s Civic Center at 450 Golden Gate Avenue. The federal court building is also known as the Phillip Burton Federal Building. Terrestrial radio transmission, 94.1 FM (KPFA, Berkeley, CA) with online simulcast and digital archiving: Flashpoints, hosted by Dennis Bernstein, for Monday, 7 MAR 2016, 17:00 PDT. 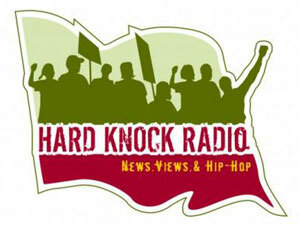 LUMPENPROLETARIAT—With all of the escalating tensions across the nation, as a result of increasing resistance to police terrorism and cops killing unarmed civilians with impunity, Davey D (co-host of Hard Knock Radio on Pacifica Radio: KPFA, Berkeley, CA), becomes an invaluable boots-on-the-ground asset. Lumpenproletariat.org will archive (after final exams) as much of Davey D’s important interviews from the streets of USA with some of the most dedicated activists around today. on “the gulf coast communities”, five years after the BP Oil Disaster. An update from Houston, Texas. 40:00 ‘Assigning police officers in public schools has become a widespread practice. More than half of all public schools have officers stationed in schools. Some people say, police can actually make things worse for children.’ The lead organiser for the Black Organizing Project. Oakland, CA. “We’re students, not suspects.” Police are imposing their punitive justice in school altercations, which had already resolved the issue by school officials. But police come in and override the school officials peace-keeping to inflict maximum criminalisation of youth and punishment. 21 APR 2015: Includes discussions of: the state of our police state in the USA; the history of San Francisco’s Upper Room, an important community institution. COUNTERPUNCH—(19 FEB 2015) For activists throughout the Gulf Coast 2015 is a year of anniversaries. It is the fifth anniversary of the BP oil spill; the 10-year anniversary of hurricanes Katrina and Rita as well as a BP refinery explosion in Texas City that killed 15 people; and 40 years since a massive influx of Vietnamese immigrants, who are now at the heart of the region’s fishing industry, began settling the region. 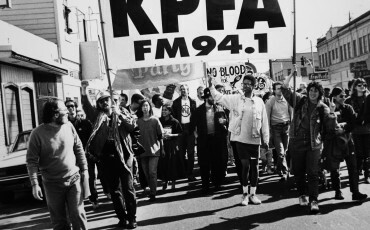 And perhaps most notably the fiftieth anniversary of the march on Selma and the Voting Rights Act. Everything from the Gulf Coast’s history and environment to its politics and culture is shaped by the energy economy. Tackling climate change is not easy anywhere but perhaps especially so in this part of the country. The Gulf Coast is in many ways the oil and gas industry’s stomping grounds. It was here after all that democratic senator Mary Landrieu made her last stand fighting for the Keystone XL Pipeline. It also happens to be one of the regions most vulnerable to the impacts of climate change, where sea levels are rising and coastal lands are vanishing. According to NOAA, every year an area off the Gulf Coast larger than Manhattan disappears due to subsidence and sea level rise. Audio archives are routinely taken down after a couple of weeks due to copywrong restrictions. I used to be in contact a bit, during my KPFA/MediaRoots.org days, with Davey D. But I lost contact since I’ve been at UMKC. Although he recently said hello and asked how I’ve been via facebook a few weeks ago. But stuff tends to get lost/buried on facebook. Hence, we’ve created Lumpenproletariat.org, as a permanent hub for ghetto life and working class life.